In the process of doing some historical research about B.C. Rich online, I discovered Bernie Rico Jr. Guitars, a company not affiliated in any way to the current B.C. Rich name, now corporately owned by Hanser Music Group. A little background-- B.C. Rich was originally founded by the late Bernie Rico Sr., a legendary guitar builder and innovator from the 60's through the 90's. Bernie Jr.- now 41, worked along side his dad and carries on the family tradition of fine guitar building. With the operation of the previous family business behind him, Bernie Jr. has started a fresh custom shop enterprise in which he oversees all details of creating new instrument designs and personally catering to his clientele, the old fashioned way. Like his father, Jr.'s interest in creating more radical body shapes and fast slim profile necks is attracting Metal players big time. Our featured guitar reflects a heavy rock aesthetic with the natural beauty of a spalted maple top. It takes a serious luthier to wanna confront spalted maple tops, as this wood requires very special handling due to tricky variations in texture and softness. It also takes courage to start over and depart from the more conventional guitar shapes. 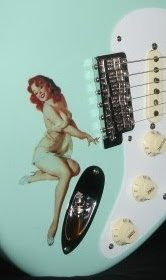 Check out the website and see what Bernie Rico Jr. Guitars is all about. Maybe he'll build your next guitar.